Sandy beaches, hilly landscape, and of course ribbons of concrete freeways mean you have landed in the entertainment capital of the world. 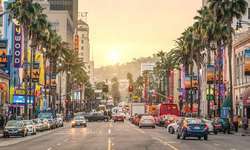 Located in southern California, Los Angeles is a sprawling city that is best known as the center of a much beloved film and television industry. If you are visiting Los Angeles for your first time, take a selfie with the iconic Hollywood sign then venture on over to the star-studded walk of fame where you can spend the hour walking among the many greats of Hollywood. From there, head on over to studios such as Paramount Pictures, Universal, and Warner Brothers for behind-the-scenes tours! Apart from its star-studded attractions, Los Angeles is also a cultural hub boasting more than 100 museums, home to an ever-expanding tech industry, and a mecca of major league sports teams (9 of them to be exact!). Los Angeles has a little something for everyone, and as a paradise of good weather, it is hard to not enjoy yourself in this gem of a city. Chicago is the land of food, architecture, and as locals are proud to announce “summering” (yes, Chicagoans love their summer’s so much they have turned “summer” into a verb to live by). Chicago is a vibrant city full of an array of both fast paced and leisure activities. Enjoy a day viewing public art displays, wandering the many parks, shopping, dining, listening to Chicago’s famous live blues and jazz musicians, or simply taking in the astounding architecture of the city. Its picturesque skyline sits directly on the waters of Lake Michigan, offering beach lovers an ideal retreat. Foodies will find comfort in Chicago’s deep dish pizzas, piled high hot dogs, or Italian beef sandwiches and history buffs will find their fix at Chicago's many fabulous museums. As the third largest US city, sprawling 234 square miles, Chicago is one of those cities that always has something new to offer even to the most veteran of travelers! Welcome to Boston! Founded in 1630, Boston is one of the oldest cities in the United States. Rich in history, prestigious universities, and wicked good chowda, Boston is a timeless city to visit for a weekend or stay for a lifetime. The quintessential brick and cobblestone walkways make Boston a lovely city to walk around and explore. Take the Freedom Trail, for example, a 2.5 mile walking route of various historic sites that tell the story of this great early nation. Venture on over to the North End for delicious Italian cuisine or catch a game at the iconic Fenway Park, home of the Boston Red Sox. With all that Boston has to offer, you will find yourself plenty busy with sights to see and activites to do. While your in the area, stop on by Concord MA, the home and headquarters of our team office! Well known as the location of the infamous battle of Lexington and Concord during the American Revolutionary War, Concord is also extremely rich in literary history. Remarkable writers such as Ralph Waldo Emerson, Nathaniel Hawthorne, Louisa May Alcott, and Henry David Thoreau all called Concord home during the 19th century.